Unsupervised test drives are the best! 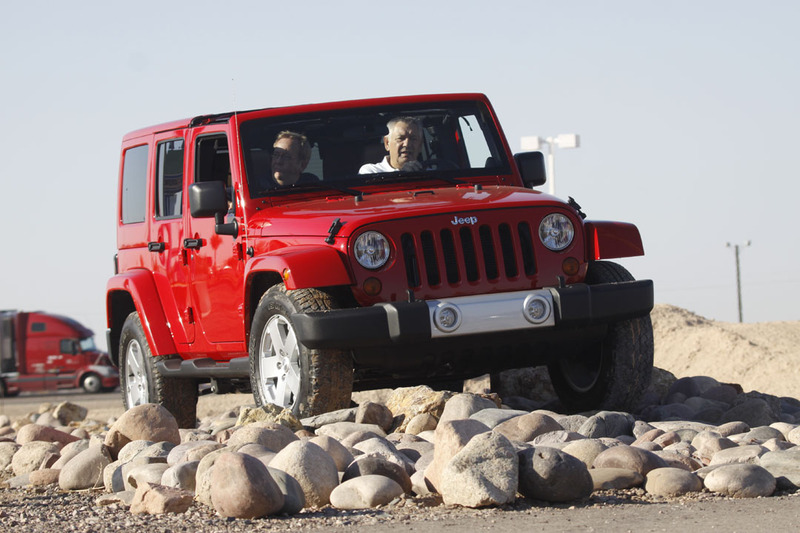 Even better, how about a unsupervised test drives in a couple dozen brand new 2012 & 2013 models? That’s how I spent my Saturday. The “active” people of the world have a different set of standards for their cars than does the every day consumer. Can the car accommodate a bunch of gear? How’s the off-road capability? Is it durable? Does it keep up with my fast paced lifestyle? 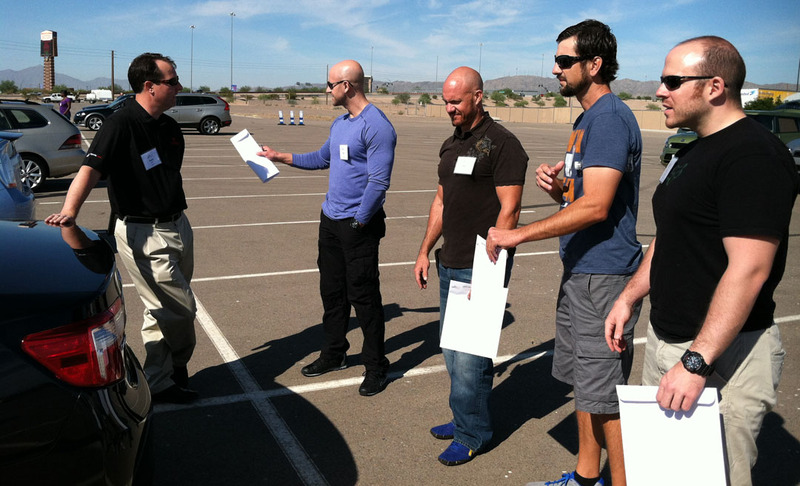 Now in its 9th year, the Active Lifestyle Vehicle of the Year (ALV) program brings athletes and automobiles together to determine which model(s) of new cars best align with an active lifestyle. When I attended the National Press Launch event for the 2013 Acura ILX & Acura RDX in March, I met Nina Russin who pioneered the ALV event. She’s the journalist behind Carspondent.com. Nina asked me to be one of seven team captains for the 2012 event. 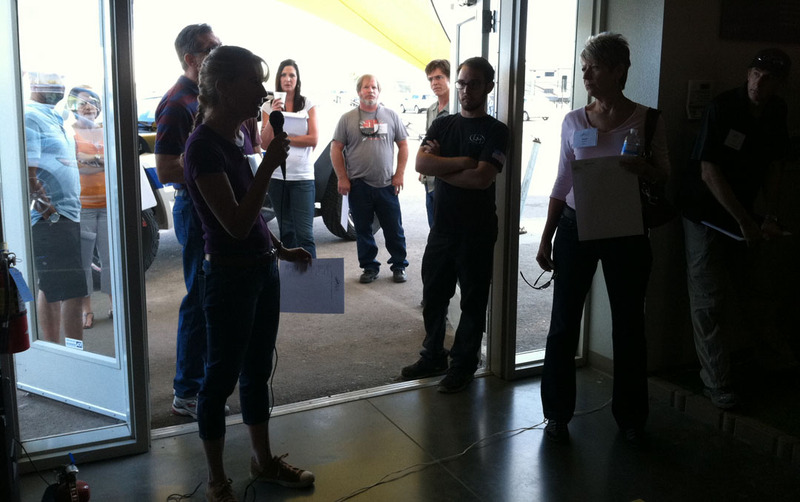 I assembled a team of 10 people to evaluate the new vehicles that were submitted by auto manufacturers to compete in the “Green” category. 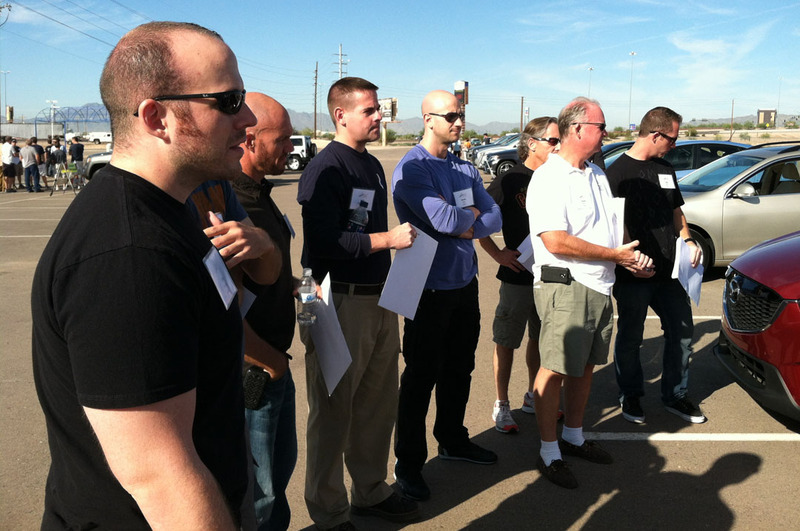 The event was held on Saturday in Chandler, Arizona and I was excited to play a role! 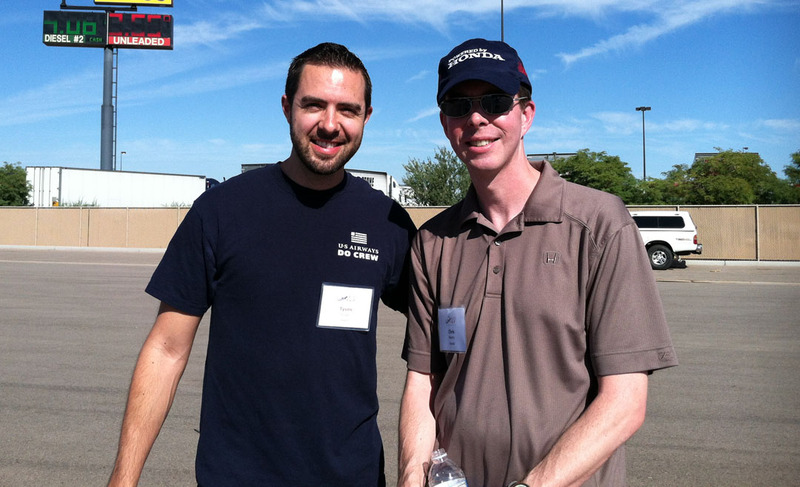 Thanks to my involvement with the ALV program, I also met Joe Sage, editor of Arizona Driver Magazine. Here’s my look at how the day went. Right off the bat, I reunited with my friend Brenda, of Brenda Priddy & Company, who was doing photography for the event. Brenda’s plate has some spy-related meaning in German, but I can’t remember what she said it was! The venue was Local Motors. LM is an auto manufacturer that has micro-factories in various locations of the United States. 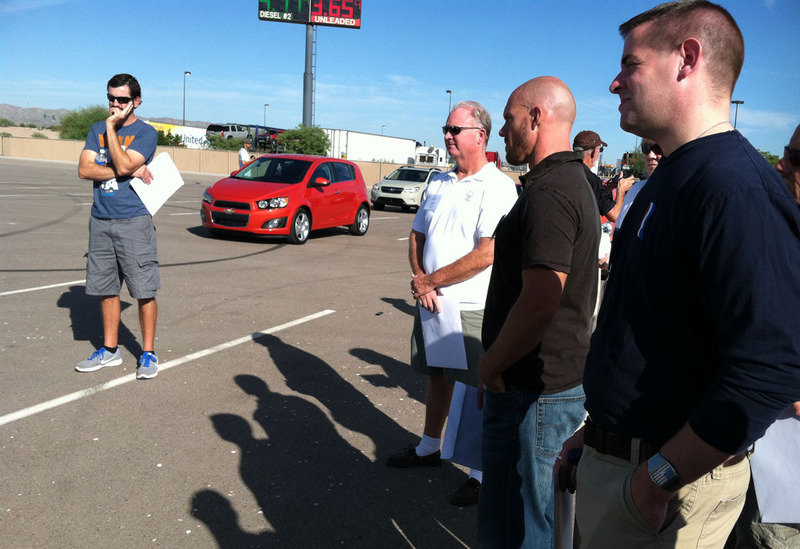 This particular location in Chandler, Arizona builds the “Rally Fighter” (background of the below picture). The team there has constructed about 40 cars so far and are taking orders for more. They also allow the customer to spend 6 days working with the assembly crews to help build his or her car! 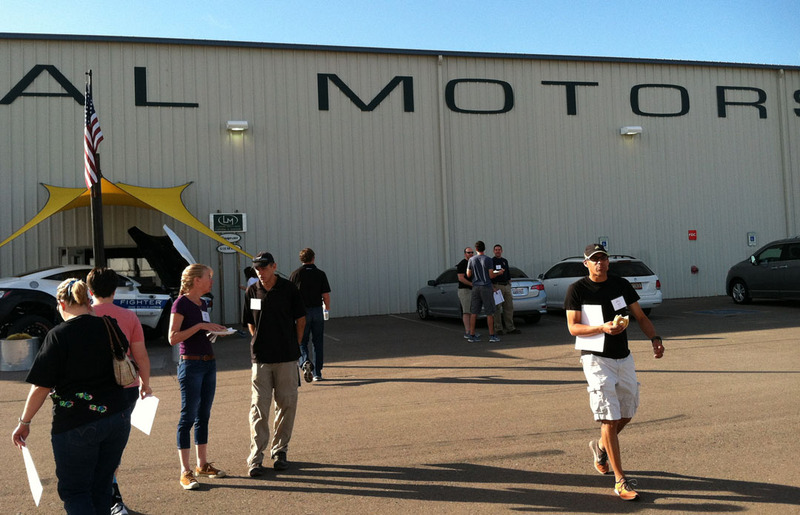 Local Motors will be representing at this year’s SEMA event in Las Vegas next month. 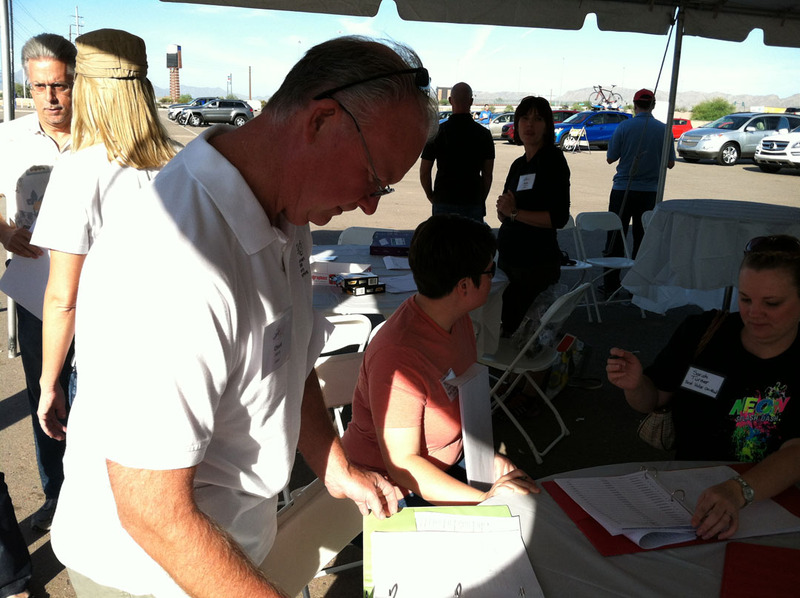 Chuck checks in at the registration table. Nina kicks off the event. 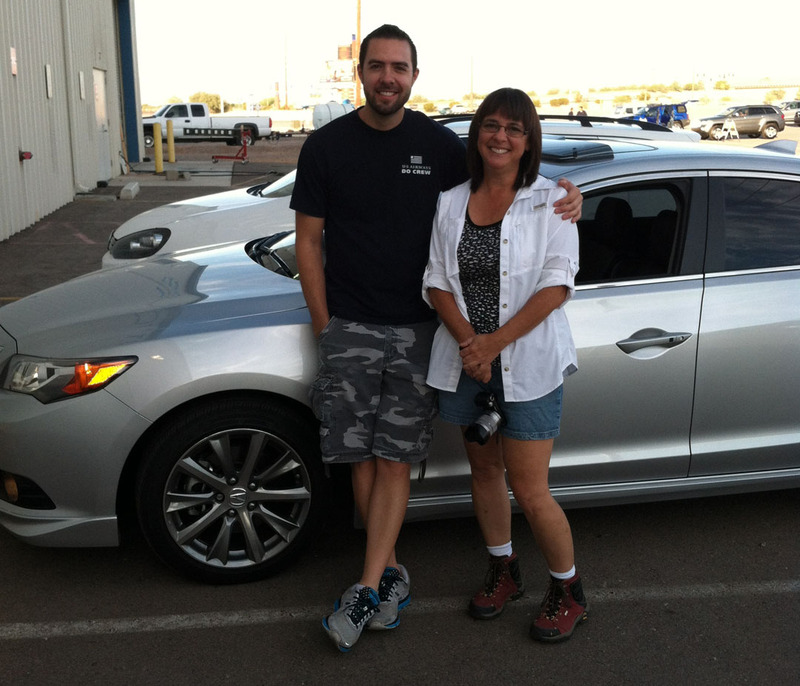 This is Beverly who came from LA to represent Mazda. 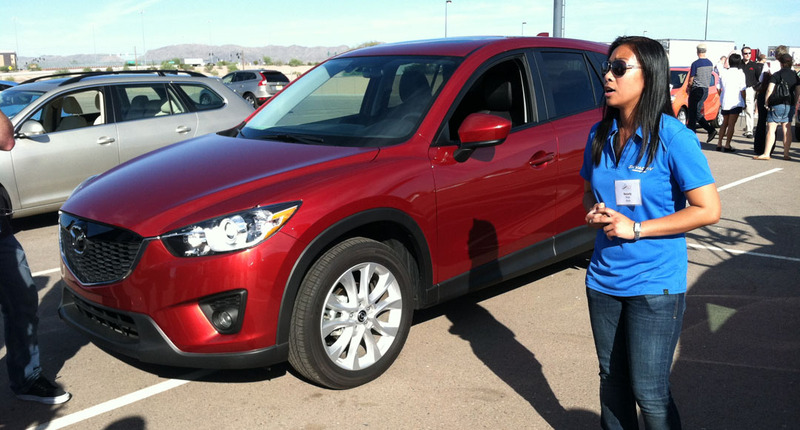 She told us about the CX-5 with SkyActiv Technology, allowing it to get 35 MPG on a traditional combustion engine, making it the best in its class. Team Green gets a lowdown on each of the 4 models we were going to evaluate. Next we learned about the VW Sportwagen TDI (diesel) which returned as last year’s ALV Green category reigning champion. 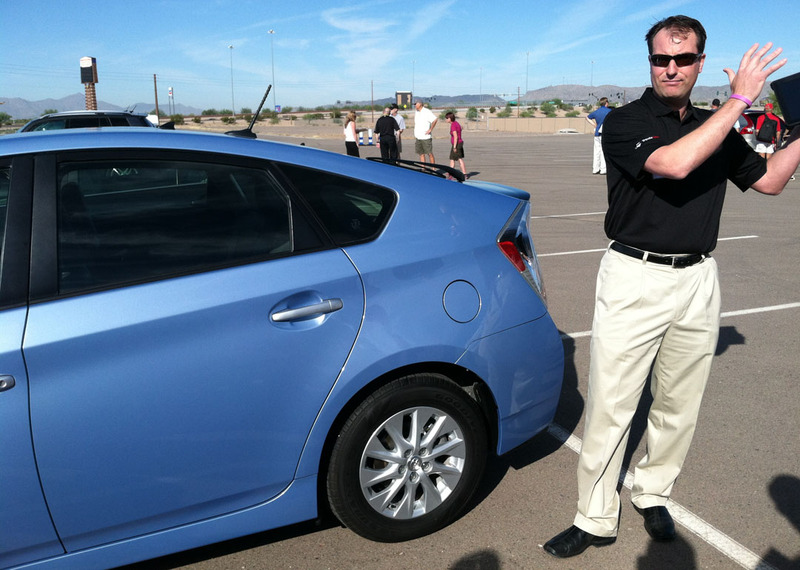 Finally, Randy Hunt from Toyota instructed us in the features of the Toyota Prius Plug-In. This car (at just over $40k) gets 50 mpg in hybrid mode and also has an all-electric mode which has a range of 15 miles. 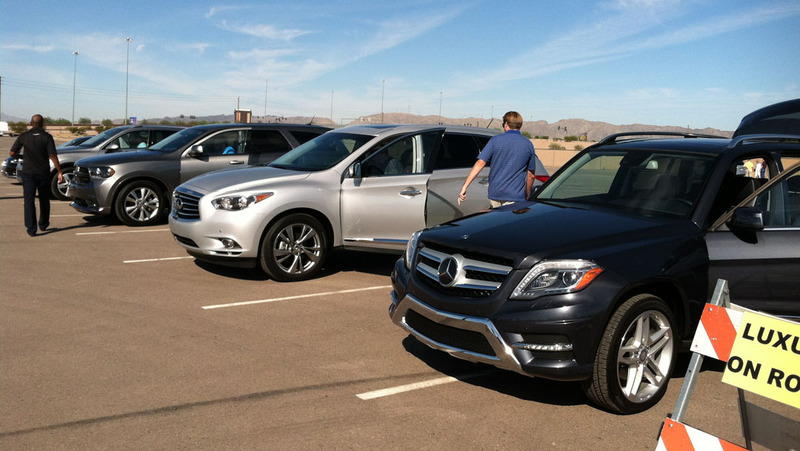 Some of the vehicles in the Luxury On-Road event. 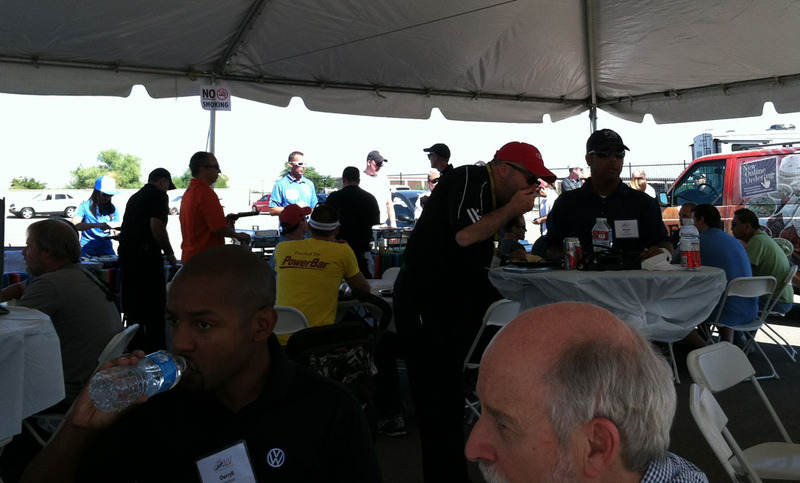 In all, there were 35 vehicles in the competition in 7 different categories. It’s not every day you meet a Honda celebrity! Chris Martin has been with Honda for over 20 years so he’s seen a lot of advancement there. 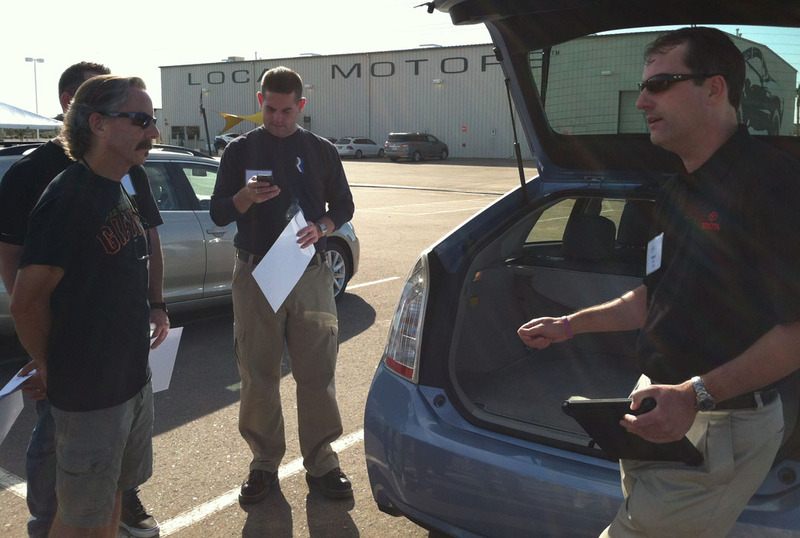 Chris came to Arizona to represent the company’s 2013 Honda CR-V which competed in the Best Value On-Road category. “Cosmic Gray” I think Randy called this Camry color. Catered Mexican food for lunch for all participants – yum! 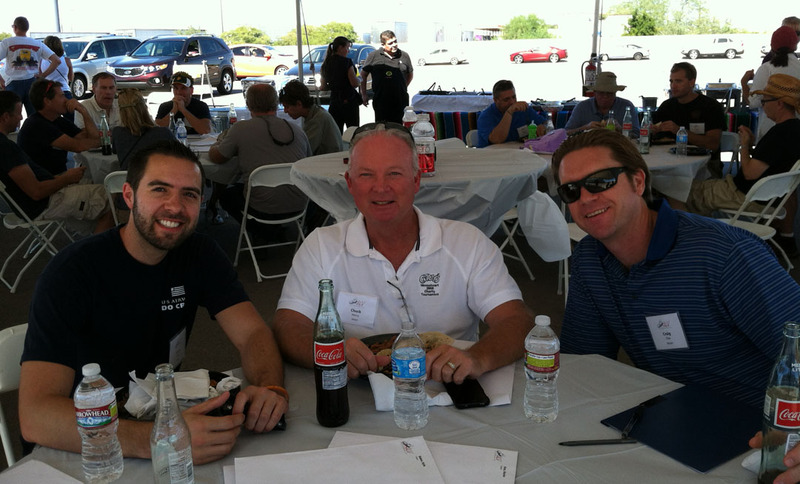 Pictured here with Green team member Chuck, as well as a representative from Nissan, Craig Pike. Nissan competed with the Xterra Pro-4X and the Infiniti JX35. Taking the Grand Cherokee Overland Edition for a drive on the off-road course. 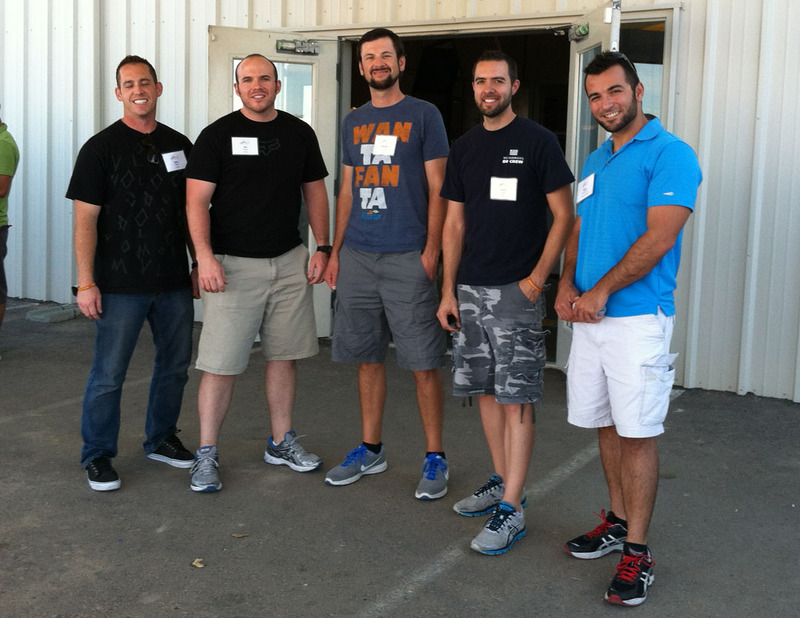 A few of the Green team folks – thanks guys for your help! Pro: Great MPG for a mini-SUV. Impressive value for $30k. Easy to navigate center stack. Con: Power is lacking. The push-button start is located directly behind the wiper lever! Difficult to even get to. 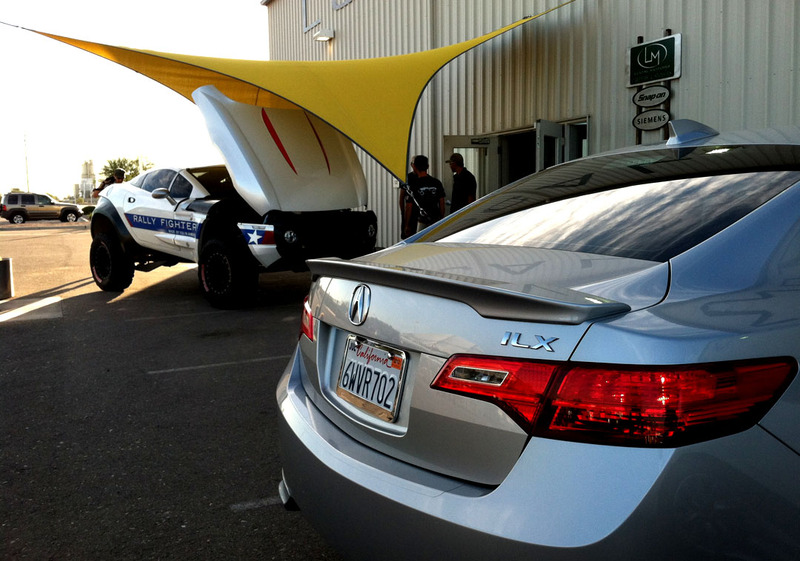 Pro: Sunroof is (as they used to say in Acura SLX advertising) “safari sized” — huge. Engine runs really quiet. There’s a plug housed in the center console facing the back seat. Ride was a nice mix of comfort and sport. Con: Leatherette interior felt cheap. In order to fold the back seatback down you actually have to use a tool (which the demonstrator didn’t have) to remove the rear headrests! Pro: This thing has guts. As Green team member Kyle discovered and I verified, it’ll lay down rubber on command! Con: Floaty boaty suspension and numb steering, “blah” styling. Pro: 15 mile all-electric range. 50 mpg in hybrid mode. Whisper quiet at 80 mph. Con: Yawn! Feels so “detached.” Information center in the dash is overload. Our test car had a tire pressure warning, and the battery pack wasn’t charged. Visibility’s not all that great. The rest of the winners (and all of Brenda’s pictures) will be posted on the ALV Facebook page, so check there for more highlights. 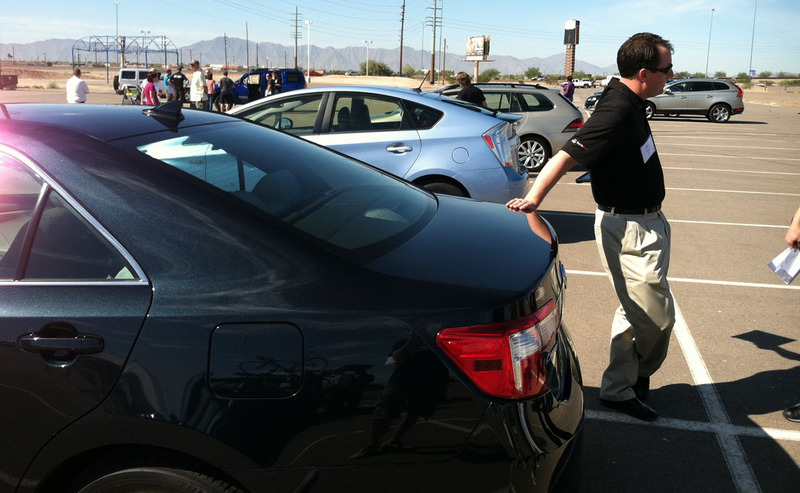 This entry was posted on October 21, 2012 at 7:47 am and is filed under Arizona, Vehicle Reviews. You can follow any responses to this entry through the RSS 2.0 feed. You can leave a response, or trackback from your own site. Another great blog Tyson! It seems to me that there are many great vehicles out there for many different kinds of drivers. Let’s face it, we all have different needs. But when I see a $40K car that gets 50mpg I’m both impressed and disappointed. How many prospective owners are going to plunk that kind of money down? Or have a payment for seven years? I’ll continue to drive my Legend and get my Fuelly averaged 23.6 mpg from the last 75 or so fill ups. It may not have the new car smell, but it is paid for! Keep up the good work Tyson! Kevin, I agree with you – $40k is a lot to put up for 50 mpg. I’ll be completely candid – I was probably not the best team captain for the green category because I’m not the most ‘green’ person out there. But, I still reviewed the vehicles objectively and was able to find good in each one. I enjoy following your Fuelly updates. Sounds like the ‘itch’ isn’t doing too bad on gas these days. I did not realize you got to spend the day with Woody, Jim, and Matt!! Woot! Very interesting facts noted. I will have you a race to 150K, my Lexus versus Alex. I realize that I have a head start…. Great seeing you again! And – great posting and photos! Thanks Brenda! I look forward to our next meet-up. For being a spy, you sure are easy to spot – I’m seeing you all over the place 🙂 After driving the TDI wagon I can see why it’s your spy-mobile of choice. I’m sure the dogs enjoy it too. Rome and Florence tomorrow and friday 😉 the 260k km very soon! Woohoo, another road trip coming up! I wish I were joining you on the trip to Rome and Florence. Please take pictures along the way. You will be turning 260k in the Fiat very soon. Safe travels and keep me posted on how things go. Well that explains it! Brenda changes her plate every year. Last year it was VDUB007. Thanks for the tip.